If you’re from the Lehigh Valley, it is likely you have heard of 100.7 WLEV,, which is known for playing all the adult contemporary hits. This top rated station often offers remote radio feeds to local and regional businesses. The Nissan vinyl wrap shown below on a Pathfinder model is the icon that you’ll see out front and center at such events. This type of promotion delivers a tremendous amount of buzz for the advertiser. The physical and very visual presence of this vehicle offers an excellent boost to business credibility, as the partnering business is instantly associated with the popular radio station. The IDWraps.com team knows all too well, about the credibility that comes with the association. In the few days of the completed vehicle being parked in front of our shop, it generated a significant boost to walk in traffic within our showroom. This was the result of the vehicle presence alone, without any radio ads or broadcasts! This Nissan Pathfinder received a full wrap, including all painted surfaces plus roof. This fresh wrap replaced an aging wrap that was Installed 5 years ago. The brand new design was created to be consistent with their other fleet vehicles done by IDWraps.com. National installation and service available near you! Another function of this Nissan vinyl wrap is to create exposure at large events. WLEV is always found at all the big Lehigh Valley events, such as Musikfest, the Allentown Fair, and various concerts throughout the year. The wrapped vehicles serve as an excellent branding anchor when onsite. Check them out at WLEVradio.com . Add a branded pop up tent, and you have the perfect portable listener or customer interface. At IDWraps.com, we’ve surely found Sprinter van vinyl wrapping to be a commonality. This van is an excellent canvas for big time messaging that inspires onlookers to turn into paying customers. This Mercedes Benz product has inspired many lookalikes, such as the Dodge Promaster, Ford Transit, and Nissan NV. All have their unique offerings which may appeal to many diverse business types. Our take on things, is that the Sprinter still seems to have the most variety in body options. They also produce what appears to be the largest body on the market. With a 170″ wheelbase, and extended body, the Sprinter may be the best choice for those whom need a great deal of space. At IDwraps.com, we surely do many a Ford F250 vinyl wrapping. Below is an excellent example of a full wrap on a brand new F250 that came to us straight from the dealership. Our client, Turf Equipment, was fortunate enough to have a supplier participate in the funding of this project. Co-op funding is something we encourage our clients to seek out from their vendors. Oftentimes, there are such finds on reserve at various suppliers whom may be excited to participate in the most effective form of outdoor advertising. I’ve personally seen vendors pay for wraps in their entirety. After all, wraps are far more cost effective than big and expensive billboards. Our client, Turf Equipment, uses this Ford 250 wrapping to promote their brand during sales calls and small deliveries. Surely it is a huge boost to their image and credibility when arriving at a client’s doorstep in this truck. In an outdoor environment currently occupied mostly by trucks with basic lettering or cheap magnets, this truck stands out in a big way. Check out our client at www.turf-equipment.com. They handle quality commercial outdoor maintenance equipment and supplies. From mowing equipment to other high end commercial grade offerings, they are sure to fill the needs of any professional. National 3M Certified Installation and Service available near you! F250 vinyl wrapping is an efficient and cost effective type of project for the IDWraps.com team. The dimensions of this truck allow for a lean use of the vinyl films. Specifically, the long sides of the truck allow for use of a very common stock vinyl width. A 48″ roll of film may be printed and applied down the entire length of the vehicle. This is done with very little waste. The upper portion of the cab is then covered with a shorter application with a smaller section with a barely noticeable horizontal seam across the window pillars. The hood is covered efficiently with a 54″ wide roll of film. Being lean with the films is very important, as the materials used in F250 vinyl wrapping comes in at a not so cheap price. No doubt, that the value is there. Just like buying anything- you get what you pay for. The better films do last longer. They also are less expensive to get off the vehicle when it is time to sell or trade. We once though that only “completely flat” surfaces are able to be wrapped. With the advent of materials and technologies, we see that our former limitations are dissipating over time. It wasn’t long ago that we were constrained exclusively to glossy flat or simple curved surfaces. Just like we know the earth is not flat- today’s products, like 3M’s Envision films allow us to literally stretch our applications to places never seen before. This is clearly stated in the 3M vinyl tool box wrap pictured below. Our latest films allow us to essentially “mold” the films to the surfaces using high temperature heat sources, which are up to 1000 degrees. The result, is a film which stays put when formed over complex surfaces. Are there limitations to the diversity of surface types for wrap materials- yes. The good news is that the surface limitations are shrinking very quickly. Call us Today to see if we can wrap that complex surface you may have in mind. Some car wrap buyers would like to believe that their vinyl wrap will last forever. Unfortunately, today’s available materials do not allow for eternal life. Even the highest priced premium brand wrap films have a limited lifespan. Vehicle wrap film longevity does vary by manufacturer, and price point. Most may have a lifespan of between 3 to 8 years. In the end, they all turn into an old car wrap. UV Damage: Yes, that’s right, the sun is the biggest enemy for a vehicle wrap. Ultraviolet light is the primary culprit for inks and pigments to fade over time. That freshly wrapped bright red wrap may very well shift in color over time. If installed past it’s lifespan, that red may look to be on the pink side of the color spectrum. Dried Vinyl: When car wraps are newly installed, the material is relatively soft and flexible. This is attributed largely to the presence of plasticizers. These are the chemicals that allow the vinyl to not be brittle. Over time, the plasticizers migrate out of the vinyl which causes it to shrink and crack. This is the most significant attribute to an expensive wrap removal. When the film is dry and brittle, it comes off in rather small pieces. Generally, wraps that are 5 years or less old usually remove with ease- in medium to large sheets. This property does vary by brand. Studies have shown that 3M films are typically require the least amount of effort to remove. Atmospheric Pollution: Acid rain is a big culprit for tarnishing the finish on an old car wrap. This damage is usually most visible on gloss finish wraps. Over time, acid rain and other pollutants can dull the finish on overlaminates commonly used in car wraps. Road salt and Dirt: Abrasive substances that find their way on to vehicle wrap surfaces may not affect the surface upon contact. These scuffing and scratching agents do their damage any time you make contact with the vehicle (even during washing!) That’s right; Without a perfect pre-wash rinse, you could be “dragging” those abrasives across the surface of the vehicle. Nonetheless, the scratching of the surface usually follows. So how do I remove an old vehicle wrap? Scroll down to read on. National installation and service available near you. How do I remove an old car wrap? There are a number of techniques that the IDWraps team uses to remove an aged car wrap. The most common is the same used for all vehicle wraps, but just requires a great deal more “elbow grease” when dealing with an old car wrap. This method is to carefully heat the film and remove by hand. This can be very tedious on dried wraps, as the wrap may come off in very small pieces. Oftentimes, these pieces can be as small as a dime. Imagine how many “dime” sized pieces of vinyl can be on the surface of an entire vehicle. Yes- it would be thousands. A typical vehicle can have over 30,000 square inches of wrapped surfaces. I’d imagine you’re getting it- that wraps should be removed and replaced prior to these conditions. In situations where the traditional method becomes too laborious, we’ll use our MBX vinyl zapper. Although not a cheap tool, this machine can remove just about any old car wrap. This is not a fast process either. The machine has a serrated rubber wheel that essentially rubs off the vinyl and adhesive from the painted surfaces. Think of it as an eraser that spins real fast and turns the wrap into small chips. The downside of the zapper, is that it does use up pricey consumables. It is common to go through a $40 rubber wheel, every hour that it’s being used. In the most extreme cases, we may go for the gusto, and use a commercial paint stripper. This solution is for the worst of the worst situations. Use of a paint stripper typically implies that there will be damage to the painted surfaces beneath the vinyl. We typically only use this method when there are no other options. A typical scenario for this technique would be on an old trailer that had a cheap material installed 10+ years ago. A word of caution is that paint damage is expected. This is “paint stripper” after all. The application typically involves brushing on the chemical and giving it dwell time to “eat” the vinyl. Once the film is sufficiently softened up, it is then scraped off. Very often, some paint comes off with the wrap. This method is usually used only when a new wrap is replacing the old installation. 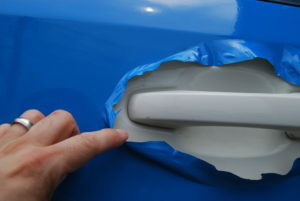 Oftentimes, new paint is required to restore the finish- if the surface is not to receive a new wrap. These days, marketers are always looking for innovative ways to deliver an effective message. In our busy world of advertising, you could easily argue that we’re all running out of space for communications. All the while, we may easily forget that our prospects are looking down. Enter floor graphics: Floors very well could be the final frontier for printed graphics. After all, I can testify that IDWraps.com has wrapped just about every type of surface you could imagine. 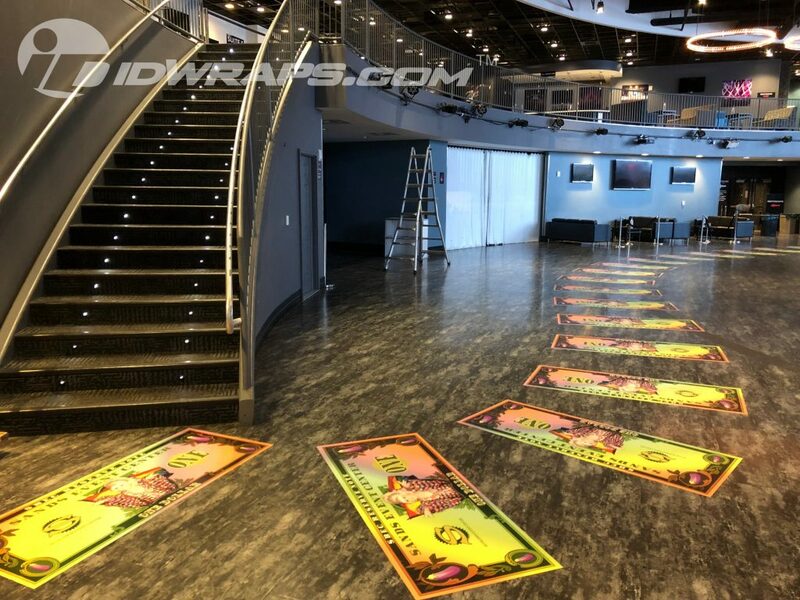 These “dollar bills” indicate a path between a performance stage and VIP area. A notion to top performers is implied with this visual. Yes, these floor graphic films may be applied to nearly any surface type. 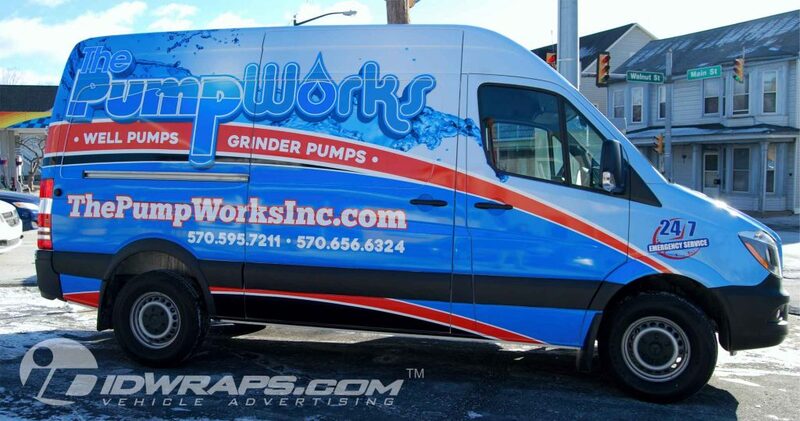 While IDWraps.com is well known for our vibrant vehicle wrap advertising projects, we are also busy with another emerging segment in the wrap business: Custom car wraps and restyling. Color change wrapping is quickly becoming a very popular way to show one’s personality on a vehicle. With various colors and finishes, a vehicle owner or lessee, may significantly change the look of their vehicle. New film technologies allow anyone to fully or partially wrap their vehicle in a color of their choice and finish. Yes that’s right- many colors are available in a variety of finish levels. The most popular choices are gloss, satin, or matte finishes. These options allow for further personalization. Best of all, is the ability to cleanly remove the wrap upon resale or lease return of the vehicle. Close up image of Custom car wraps bumper area. Sweating the installation related details is not an option when it comes to quality color change wrapping. If we really think about it, a vinyl wrap may be viewed as a substitute for paint work. With this mindset, comes the need for a high level of detail when it comes to the installation. When IDWraps began doing restyling custom car wraps years ago, the prevailing thought was that these would be an easy application. After all, we don’t have to line up advertising text right? To our surprise, we found a new installation technique requirements to truly deliver a paint like finish. On advertising wraps, it’s quite normal to see a little original paint color on deep recess areas. The function of an advertising wrap surely has a different function, as it is essentially a billboard on wheels. On the contrary, when we’re wrapping someone’s “baby” (we love our cars, correct?) then it is imperative to take some aspects to the next level. Wrinkles are the mantra of the novice installer. There’s surely nothing worse than to pick up your newly wrapped vehicle, only to be disappointed by an array of wrinkles throughout the installation. Vehicle wrap wrinkles are the result of poorly distributed excess vinyl during the installation process. When not applied correctly, the film may bunch up on corners. This nasty type of blemish is avoidable when skilled and experienced hands are at work. Yes, it takes years for an installer to correctly apply color change wrapping. Wrinkles are also prone to failure, as they are often under pressure. In essence, a wrap wrinkle is material that was compressed. This compression often expands and lets loose over time, making the eye sore even worse. 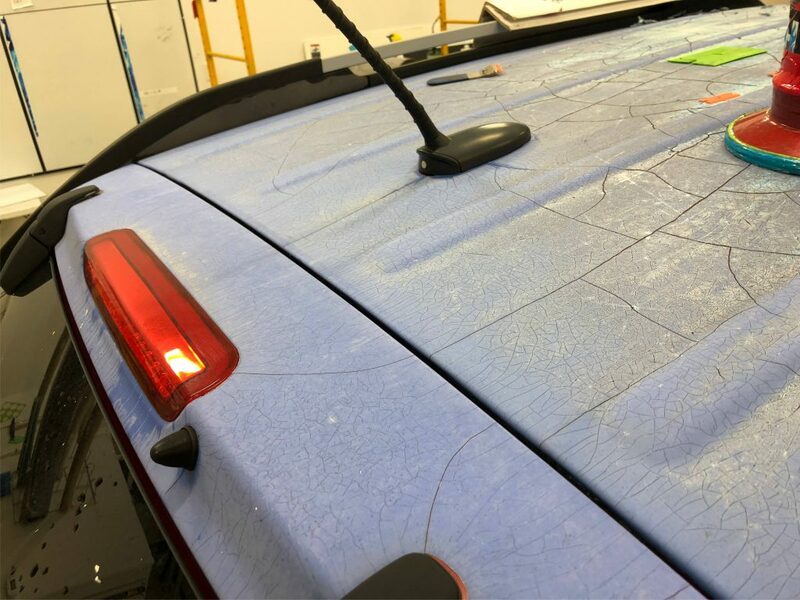 Some installers prefer to allocate a limited amount of time for their restyling custom car wraps installations (often due to discounted pricing.) This skimping on time spent on the job very often be attributed to surface preparation. Dirt, tar, and many other types of surface contaminates can result in bumps and blemishes that project through the wrap. You see, wrap films are very thin and typically show every little bump and anything that physically lies on the paint surfaces. These contaminants also affect the durability of the installation. IDWraps begins every installation with a thorough vehicle wash with an industrial grade automotive detergent. Concentrated spot detergents are used to clean any areas with any significant build up of dirt or surface contamination. After the general cleaning, it is on to the mild solvent preparation. In this step, all residue is then removed with a 70% isopropyl alcohol solution. This ensures that the vehicle is completely free from all contaminants, including leftover soap, etc. Only now is the vehicle ready to receive a vinyl wrap application. Loose hanging vinyl and jagged trim cuts are never welcome on any vehicle wrap. Precise and smooth cuts are an integral part of a quality restyling custom car wrap. If your wrap looks like it was trimmed with a chainsaw, it will undoubtedly be difficult to impress your friends. Many of these demons can surface months after the initial application. Loose vinyl that is sloppily tucked to dirty and contaminated inner surfaces are almost guaranteed to pop out over time. For consumers, this is the unfortunate side with many low cost restyling custom car wraps installations. These folks will not realize they got a bad install until potentially weeks or months later (after the project has been paid in full.) At unscrupulous wrap providers, there may be resistance when there is no financial leverage, like a balance to be paid. Yes, restyling custom car wraps installers use very sharp knives to trim vehicle wrap materials. Some of this has to be done on the car (no other way.) With experienced and properly trained techniques, these films can be trimmed on the vehicle without harm to the paint. These types of cuts require a ton of practice and the absolute perfect amount of knife pressure. There is a very small difference in pressure between cleanly trimming vinyl and going right through to cut the paint. This perfect balance is not done by someone whom has done a handful of wraps. At IdWraps.com, this procedure is forbidden from installers with less than 100 vehicle install experience. They are also required to pass extensive testing on company owned vehicles and painted sheet metal. One nick in the paint, and you fail. We do not want to nick anyone’s paint. ever. Another advent in our industry has been the use of Knifeless Tape. This filament based trimming invention has drastically reduced our need to use knives on vehicles. It also comes in very useful for hand laid striping and restyle projects. In the end, we want to treat your vehicle as if it was our own. 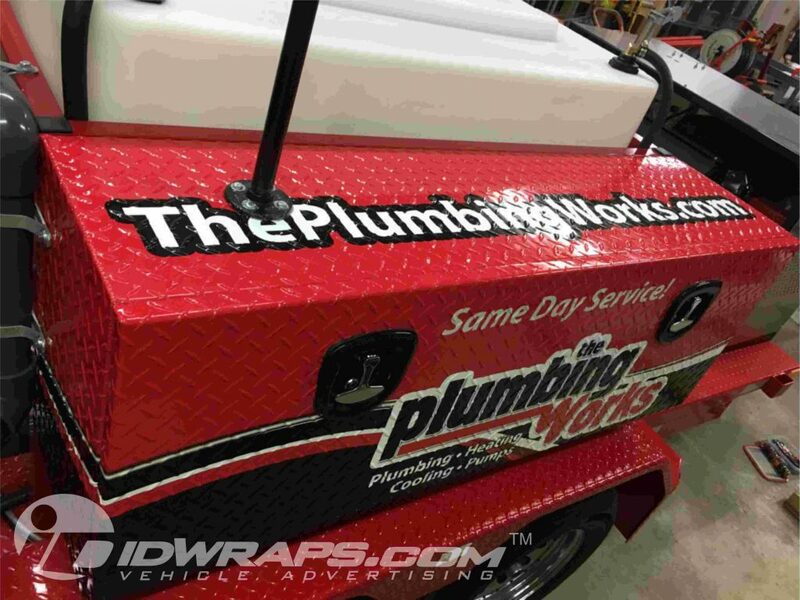 Installing a vehicle wrap is like covering a bowling ball with saran wrap, and expecting no folds or wrinkles. Surely there are a great deal of techniques that get this accomplished. To wrap over compound curves (convex and concave alike,) the material must stretch. All restyling custom car wraps manufacturers have published stretch specifications which exhibit the mechanical limits of their materials. Most allow for an average of 130% stretch. This means that a 10″ piece of film may be stretched out to 13″. Many installers are tempted to speed up installs by heating up the vinyl films and pull the film hard around corners and curves. This action almost always results in overstretching of the films. Remember that all materials like this have dimensional “memory.” This memory means that that formerly mentioned 10″ of vinyl always wants to return back to it’s original dimension after it has been stretched. Nonetheless, areas of wrap installation where the film has been stretched are under considerable stress. Consider this tension to return to original dimensions a battle of stretched vinyl vs adhesive strength. This battle of tension is only won with careful installations. 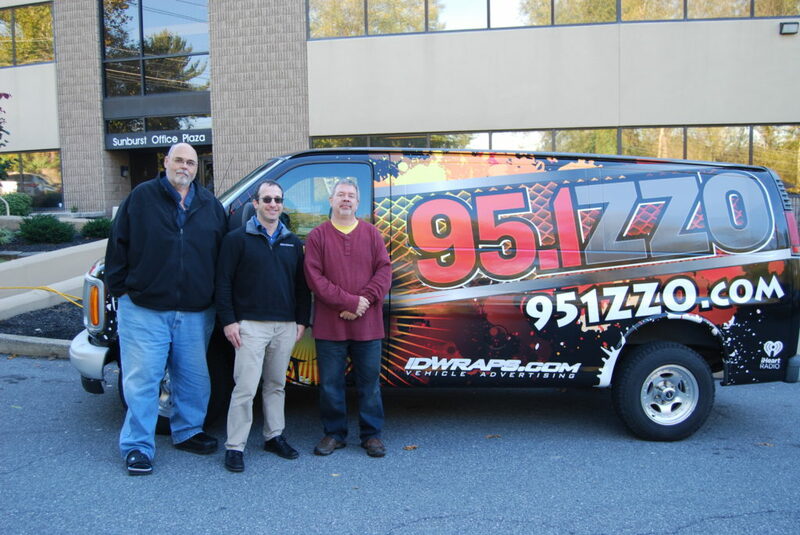 Many folks local to the Lehigh Valley have very likely seen the WZZO radio station van running around the area for many years. I’m thinking that this has been on the road for over 10 years with its original air brush job. While this was really cool looking years ago; airbrush jobs are EXPENSIVE. We’ve witnessed custom paint jobs like this exceed the $20k mark. No only is there a high expense to unique paint jobs, but most are not easily removed. The usual solution when the vehicle is ready for turnover, is a new paint job. This may get costly in itself. Vinyl wrap advertising has surely become the solution. The advent of vinyl wrap advertising has truly created a excellent alternative to custom paint. Wraps cost less. A quality paint job on a vehicle may cost 2x or more than a full coverage vehicle wrap. Gone are the days of the unaffordable vehicle wrap. Like anything, as time goes on, technology costs do go down over time. The wrap industry has made leaps and bounds when it comes to efficiency of equipment and skill sets. Our printers print faster and better and the installation labor force is sharing techniques learned from around the globe. Ultimately, these factors have driven pricing of vehicle wraps down to 1/4 the cost they were 15 years ago, when it all started. Back then, it was only the biggest national advertisers, like Coca Cola that were doing wraps. Today, the IDWraps.com team is wrapping for the big guys, but also for many single operator micro businesses. Yes the single employee plumber with one van is wrapping their van. The van wrap is often the fuel needed to grow these small businesses. If you compare the value of a van wrap to billboard advertising- this singular van owner could be getting $1000+ of advertising value out of that one wrap every month. In our town, billboards start at over $1200 per month. Yeowch! Wraps are removable. According to the Patriot Act: commercial vehicle owners are compelled, by law, to remove all identifying graphics from their vehicles upon sale or trade in. Not only is the law a good reason to remove your graphics, but you also don’t want some criminal or crazy person running driving around with your branding on the vehicle. Imagine someone tailgating and causing much road rage with your name all over the vehicle. Yeah, bad idea- right? These are surely the wrong people to be your brand ambassadors! Also, if we examine traditional vehicle lettering, we must consider the “ghosting” effect left behind when decals like this are removed. Everyone has seen a retired Uhaul truck that still has a shadow of the old branding that some loony may be driving around. The bit benefit to wraps, is that there is NO ghosting of letters left behind when removed. We’ve all seen retired commercial vehicles where lettering has been removed, yet the vehicle clearly has residue in the exact shape of the removed graphics. Take older Uhaul trucks for example. This is a popular used vehicle, as they are sold at a very low price when Uhaul retires each unit. More often than less, these trucks still spell out “Uhaul” after graphic removal. There is almost always grey glue residue, or a change in surface finish in the areas where the graphics were previously installed. Wraps protect your original paint. 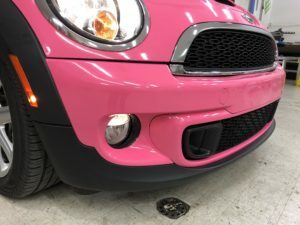 That’s right- when the IDWraps.com team covers every square inch of your vehicle’s painted surfaces- the original finish is protected from many hazards. When acting as a UV ray barrier from the sun, a vinyl wrap advertising installation absorbs all of the abuse that the sun may dish out. UV rays are responsible for paint fading and oxidation. This may be hared to notice on a daily basis, as all colors and paint pigments do change color and fade over time. This includes white. Yes, it is tough to imagine the color white fading, but white can actually discolor significantly after a few years in the sun. We’ve seen many white vehicles turn a yellow-ish color. Think of it like an atmospheric nicotine stain. The other significant hazard to your paint would be contaminants that may lay on the surfaces. Things like road salt, acid rain, and various pollutants can cause your paint to loose its luster after accumulating and attacking the finish. Wraps provide an air tight car cover which helps preserve the original paint condition. This, without a doubt, increases resale and trade values on any wrapped vehicle. Wraps are digitally printed. Digital printing associated with vinyl wrap advertising allows for unlimited design possibilities. When you have 16 million colors to choose from, and photo quality resolution at your fingertips, a wrap provider has clear advantages over painting. Want a photo of your mascot on your vehicle? No problem. The print quality has come a long way in the wraps industry. The IDWraps.com production team regularly prints photo enlargements and fine art on the same wide format printers we use to print vehicle wraps. Usually, the only constraint on our projects is the quality of photos given to us by any given client. We feel sometimes that the quality of cameras need to keep up with the level of print quality on our latex printers. It is always good to be ahead of the curve. Another excellent client benefit to digital printing is the ability to proof our work through the internet and through physical color proofs. The internet has made collaboration super easy. Our designers may email artwork to clients instantly for review and change advice. Once all artwork is finalized through email, a hard copy is printed using the exact ink and vinyl materials to be printed on the vinyl wrap advertising project. Wraps cost less to repair. In the vehicle wrap repair world, repairs come with much less fuss and expense than that of automotive paint. Of course, a new wrap will never fix a smashed fender. In these cases, actual body work is required. 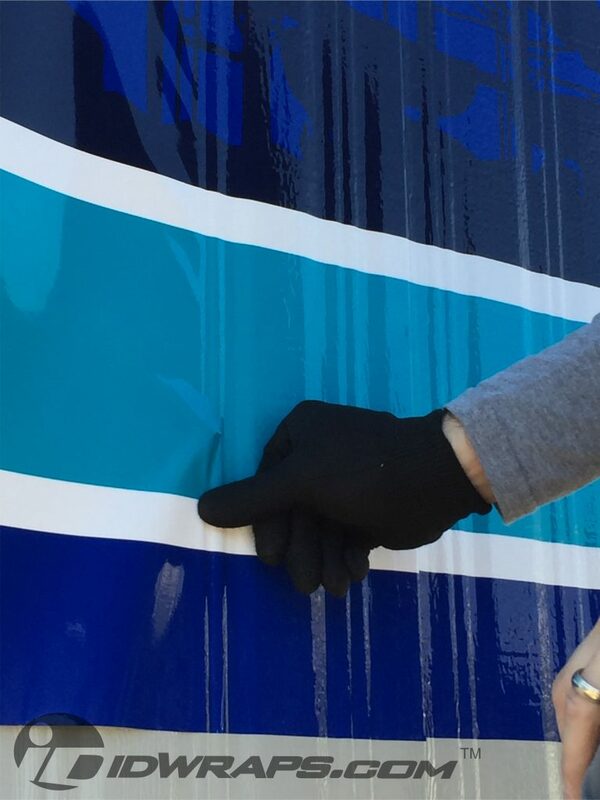 However, if you encounter perhaps a scuff, graffiti, or a small incident, wraps may create a bit of a buffer between your paint and the offender. With wrapping, there is no need to mask off large areas to protect from over sprayed paint. Also, the prep process is much more efficient than the painting process. Surprisingly, material cost of wrap materials are less than that of quality automotive paints. At IDWraps.com, we keep artwork on our servers for at least 5 years. This way, we’re ready to reprint any portions of a wrap should any part get damaged. This measure is also very handy when our clients get additional vehicles and they want a consistent looking fleet. At IDWraps.com, we’re always on the lookout for a new and challenging surface to wrap. 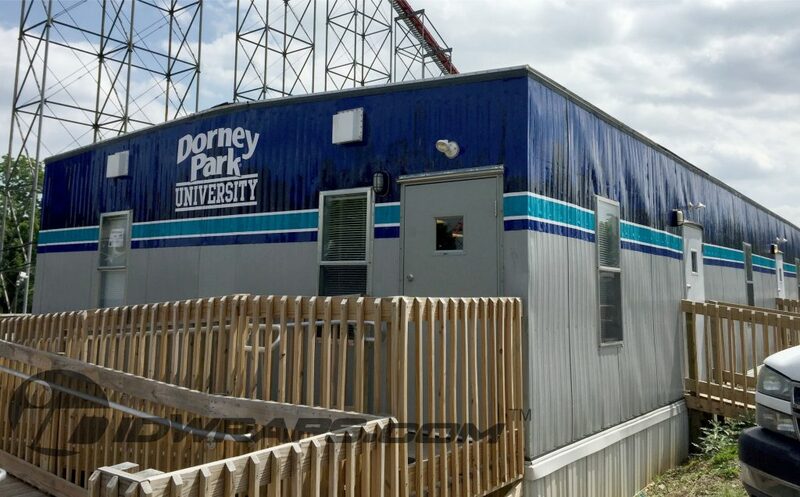 Pictured below is a office trailer building graphics wrap we printed and installed for Dorney Park. Most folks are familiar with our exciting installations on various vehicles, interior walls, and windows. Now more than ever, is there an advertising industry push for more options for outdoor exposure. Businesses are seeking any message and image delivery opportunity they can get. Fortunately, the wrap graphics industry has been working diligently on new materials. Now available are vinyl graphics that we may apply to textured surfaces. These new vinyl formulations are allowing for the super heating of materials where the prints are essentially thermo formed to the surfaces. Our 3M Certified installers heat the materials up to 1000 degrees and then carefully roll the material into the application surfaces. This allows for very contemporary looking installations on various surfaces. Many of the new surface that we can wrap include, but are not limited to: masonry, brick walls (both standard bricks and hollywood block,) sidewalks, siding, and much more. In addition to the high temperature features of these films, is the high tensile strength of the films. 3M’s new IJ480 Envision brand films are composed of a non PVC chemical makeup which is not only more environmentally friendly, it is more durable. To add to these benefits is also an easier product to remove. Most vinyl graphic films tend to tear as they’re being removed. This is especially the case for installations that may be a few years old. The films actually dry out and can make building graphics wrap removal quite the task. Removals are surely less labor intensive when the materials to be removed come off in larger sheets, rather than tiny pieces. The Envision film’s strength pays its dividends by resisting tearing upon removal. This results in an overall increased overall return on investment. While the film may have a higher initial cost when first installed, the overall cost may be lower due to the related savings on removal labor. Here’s a closeup showing the detail of how the materials conform to the irregular surfaces. 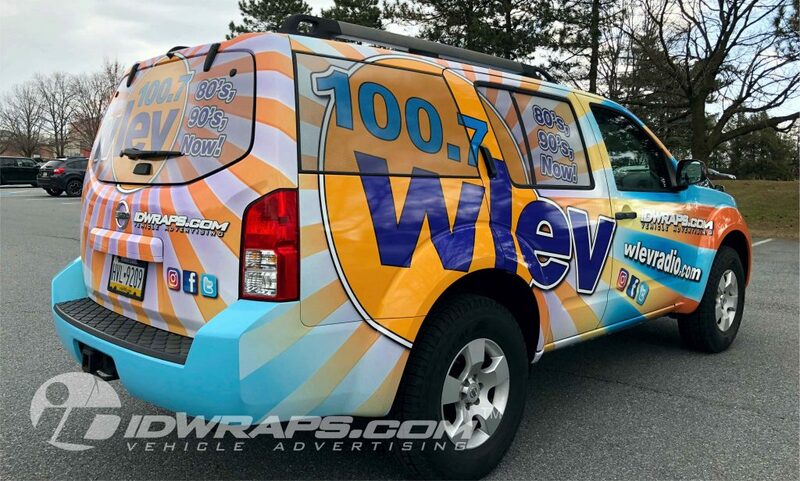 Here is an excellent vehicles wraps example for the folks at Cat Country Radio and Cumulus Media. This Jeep Liberty came to us with a tired 6 year old wrap which was done by another shop. We removed the old graphics and installed a fresh 3M Certified full wrap which has a high gloss finish. Typical radio station vehicles need to look their absolute best, since they’re often used for satellite spots at the locations of their advertisers. This Jeep travels throughout the Valley for such spots. These vehicles are usually parked in front of businesses where the optics of the promotion is unavoidable. The vehicle wraps essentially become a beacon of representation for the satellite spots where they broadcast from car lots and many other types of businesses. The impact that vehicle wraps present is arguably exponentially greater than other forms of outdoor advertising. When this Jeep is parked along a busy road, it may garner many thousands of impressions every day. In some cases, thousands of impressions may be reached after just a few hours. Many commercial highways in populated areas may have more than 30,000 cars pass a given point every day. Just imagine comparing this advertising power to direct mail. If we were to study the cost of the lowest priced form of direct mail, which is postcards; We’ll find that an average small mailing may cost up to 50 cents per card mailed. If we apply this metric to a vehicle wraps that may receive 2000 impressions on any given day, this would reflect a direct mail value of $1000.00. This is in just one day! Considering that 3M vehicle wraps cost between $1000 to $4000, the ROI is indisputable. Many IDWraps.com clients have raved about the vehicle wrap investment paying for itself within only weeks. This does vary from client to client, but in 12+ years of wrapping vehicles- we’ve never heard someone say they wouldn’t do it again. Get Your Free Quote Today at www.IDWraps.com. So back to the story on this specific Jeep. Unfortunately, the shop that wrapped this vehicle previously used low cost films which proved to be very difficult to remove. The films were very brittle and exhibited cracking throughout the installation. When the films are dry and the adhesives were hardened. This meant that we were in for a ton of labor on this removal. The films actually came off in very small pieces, many being less than 1 square inch in size. Worst of all was that the adhesive on the economy films used actually destroyed much of the paint. The contamination from this wrap film actually damaged the clear coat, making it flake an bubble off. The glue also somehow leached into the paint and discolored the pigments. This turned the formerly nice metallic silver finish into a terribly unattractive tan color. Nonetheless, it surely pays to invest in a quality wrap film. The most common film used by IDWraps.com is 3M’s IJ180MC. The 3M IJ180 series films have been on the scene for over 10 years with an excellent track record of durability. One key aspect driving this durability is the matching system overlaminate that we apply over the printed surface. A quality overlaminate not only protects the valuable vehicles wraps prints from scratches, but also from UV exposure as well. That’s right, the sun can attribute to most of the wear and tear that a wrap experiences over its lifetime. The sun not only can fade the colors over the years, it can also dry out the vinyl materials and adhesives. Dryness in the vinyl may cause cracking on the surfaces. This cracking is usually evident after more than 5 years of wrap life on horizontal surfaces. Horizontal surfaces may consist of hoods, roofs, and trunk lids. When the glue dries out, it becomes much more difficult to remove and may separate (stay on vehicle) upon removal of the wrap. The other key component of this film is it’s removability. 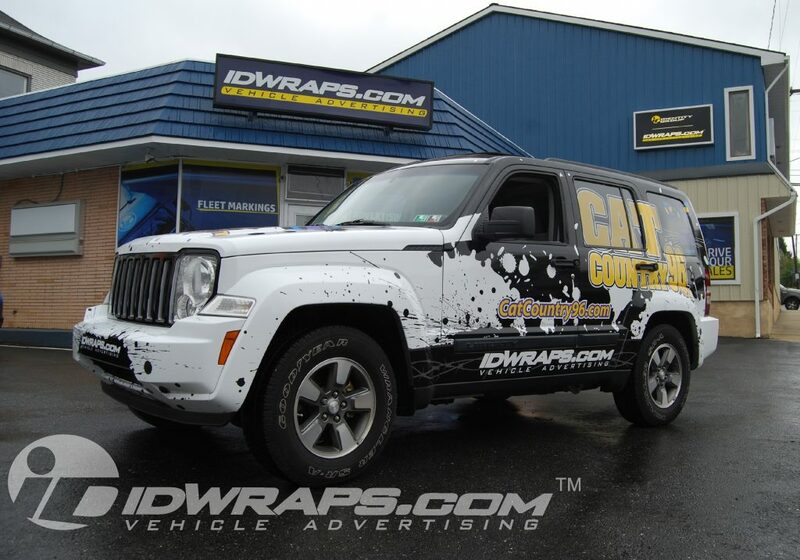 This Jeep wrap project is a prime example which exhibits the importance that a film is designed to be removed. Not only is damage to your vehicles paint an obvious concern, but the labor associated with a removal is to be considered as part of the total cost of the wrap investment. 3M films have been proven to take up to 1/3 the labor to remove as many of their competitors. In the end, a quality 3M wrap may cost a bit more, but in the long run- it could possibly be one of the lowest cost options. This factors in both durability and lower removal cost. It essentially may last longer and come off easier when your ready to sell or trade the vehicle. The big bonus to having a full vehicles wrap is that your paint is shielded from the elements. That’s right- the wrap takes the brunt of light scratches, swirl marks, light stone chipping. The other benefit is color fade protection. Most folks don’t realize that all automotive paints do indeed fade over time. This is a constant change that starts as soon as a brand new vehicle hits the lot. In fact, our new car dealer clients only place promotional decals on top of vehicles for 6 months or less. Any longer, and the decal actually leaves a “ghosting” effect behind which is in the shape of the formerly applied lettering or graphic. What actually happens is the decal is shielding the paint from the sun’s harmful ultra violet rays. So if color preservation is noticeable within a 7 month period, imagine what is is like after 7 years. As we change out IDWraps company vehicles which have been wrapped, we often find ourselves with a distinct used car market advantage. Sometimes we’ll have 50k+ mile vehicles with brand new looking paint. This helps tremendously when selling a new vehicle. When all others have relatively dingy looking finishes, ours stands out. Nonetheless, our sells for a higher dollar. This is why leasing companies absolutely love vehicles wraps. Your essentially installing an air tight car cover for the term of the lease on “their” vehicle. What Else Can We Wrap?